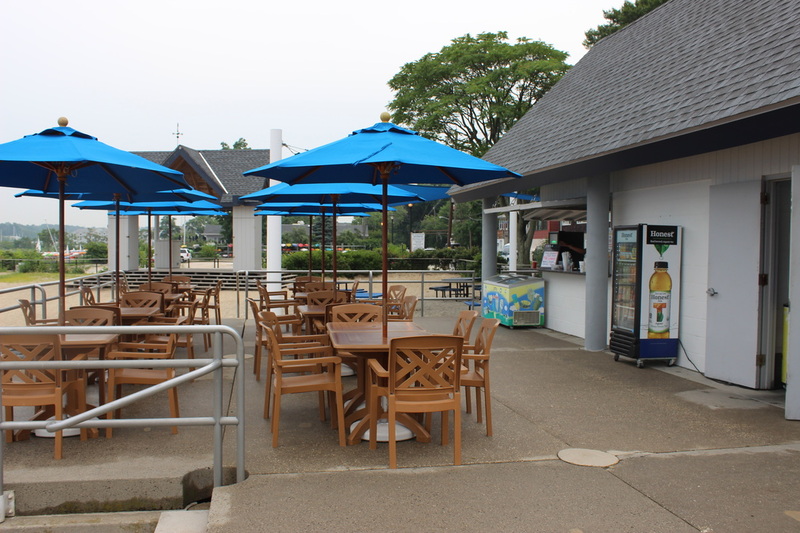 July 1, 2015 -- The Sea Cliff Beach Cafe is back. 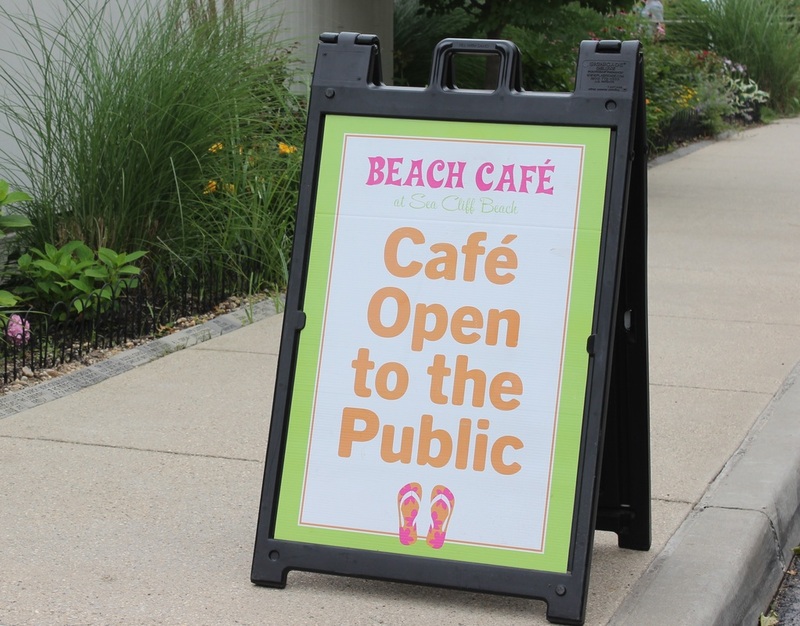 After the long winter and the restless anticipation of a Sea Cliff summer one feels each spring - the Beach Cafe, a stop in the daily routine for many residents during our warmest months, is now once again open every day through Labor Day. Hardly your ordinary beach concession stand, with a wide variety of healthy and delicious fare for many tastes and moods at very reasonable prices and a spectacular view of Hempstead Harbor, as well as attentive and friendly service, the Beach Cafe at the Sea Cliff Village Beach pavilion is no stand at all, but rather a complete restaurant and the perfect place to go this July and August for a casual meal, to meet friends for a cup of coffee and a snack, or just to laze while sipping a fresh brewed iced tea gazing at the shore as the laid back summer activity unfolds. Visitors to the Cafe do not need to be beach members or to pay beach admission for entry. 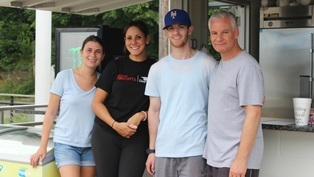 Rob Byrne, formerly of Bernard’s in Glen Head, has operated the beach concession since 2013 and is the owner of the Port Cafe in Port Washington and the Bagel Cafe in Massapequa Park - and many of the offerings found there, you will also find at the Beach Cafe. There are two separate menus - one for breakfast which runs from 9 to 11:30 am and another for lunch, from 12 to 5 pm, except on Fridays and special events when the Cafe remains open until 9 pm. In the mornings, the Cafe offers egg sandwiches, bagels, oatmeal with fresh fruit, as well as complete breakfasts from egg white omelettes to pancakes and french toast with a side of bacon, sausage, or potatoes. For lunch, the Cafe’s manager Christina DeMeo says, “people love the paninis - in particular honey turkey.” The Apple Cranberry Chicken Salad and the Grilled Chicken wraps are in high demand as well, as are the salads, and kids and adults alike rave about the chicken fingers and the burgers - whether it is the traditional bacon and cheese variety or the Southwest Burger. "Fresh brewed iced tea and pink lemonade are both very popular" added Morgan Kaufman, who joined the Beach Cafe family this summer. It is not only the great food that makes the Beach Cafe stand out, but also the friendliness of Mr. Byrne and his staff and the comfortable sense of community one finds here. “I love it here,” he says. “This is a great atmosphere - very family oriented and laid back,.” The key to running many businesses, he explains, “is having a great staff,” and he speaks very highly of his own - Hector, Christina, Morgan, Brandon, and his son Christopher - all of whom he describes collectively as a team that makes everything work. Four have been with him since he opened the Beach Cafe just over two years ago. Some are local college-aged young adults working summer jobs, and others have worked for him for many years at Bernards, including Ms. DeMeo. Although not a resident of Sea Cliff, Mr. Byrne has given back to the community and to the Beach. “He is very generous,” says Justin DiPietro, co-chair of the ﻿Beach Events Coordinating Committee ﻿ explaining that during this past May’s Beach Clean-up, Mr. Byrne, although not yet open for the season, donated wraps, sandwiches and coffee for the dozens of volunteers, trucking the provisions over from his other restaurants. During fundraisers such as the Mutual Concerns Crash the Beach Benefit last year and Sea Cliff Arts Council events, he has donated 10% of his proceeds to the organizations, and has also contributed gift certificates for raffles at Sea Cliff Beach Committee fundraisers such as last year’s Sea Cliff Palooza and the Pub Crawl. The Beach Cafe is open daily, weather permitting, from 9 am to 5 pm and til 9 pm on Fridays during the Beach Concerts and on evenings when special events are being held. Visitors to the Cafe do not need to be beach members or to pay beach admission for entry.